I'm playing along with Cindy's weekly Eye Spy game and this week's great theme is by Karin. We don't use the front door much, even guests tend to come to the back door, shooing chickens out of the way as they approach. But I do have a thing for front doors. I love brightly painted old, four panel doors. Saying that, ours looks a bit dull and boring. I'm not overly fond of the colour scheme of our exterior and look forward to painting it one day. That's when we can paint our door something bright, like red, or green or blue. Actually, looking at this photo maybe I'll just do it soon anyway, it's screaming out to be painted, even if it will clash with our putty coloured house. Head over to Cindy's to see some more front doors. I did read somewhere that red is a very good color for your front door as it brings luck or fortune, one of those, anyway neither can be bad can it. I love the tin with the flowes in it too, very cute! Oh yes, I think bright red would be a lovely idea! 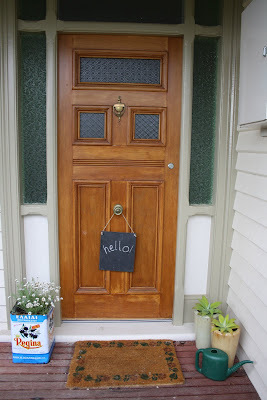 i love looking at all these gorgeous front doors and love the hello there! I think a deep red door--almost wine-colored--could be very nice indeed with your putty-colored house. Even unpainted, your front door looks pretty and welcoming. seriously LOVE the olive oil (?) tin for a flower pot!!! Hello, my parents have a purple front door on their 1820's house and I think it looks fab! Oh yes - no one use the front door here. Learnt that when one of our neighbour popped over with a giant zuchinni gift at the back door! Since then, we have painted our back door "Red"! Wait till you see it, Michelle. I love your tin flowerpot idea. Am on the lookout for an extra large tin now! Thanks! Meagan.